Mobility-challenged people always faced huge obstacles when it comes to the RV lifestyle – until now. Winnebago Industries just rolled out their gorgeous new wheelchair friendly motorhomes, the Intent 30R AE, Adventurer 30T AE, and Forza 34T AE. The freedom to roam with your home is something most RVers take for granted – except for those people who rely on a mobility device to get around in the world. The 15 million people in the U.S. who need a wheelchair, walker or cane usually have few options for RV travel. Starting in 2019, the innovative RV designers at Winnebago Industries changed all that. The company’s specialty RV division just launched three new RVs made exclusively for mobility-challenged campers. Each rig can be ordered from RV dealers around the country. “Before our accessibility-enhanced Winnebago, the thought of going on vacation was more stressful than just staying at home,” said Mike Freeman, Winnebago Forza 34T owner. In a Winnebago press release, Freeman explained the travel challenges other travelers don’t experience. Three standardized floor plans are available for the wheelchair friendly motorhomes. The lineup is made up of the Intent 30R AE, the Adventurer 30T AE, and the Forza 34T AE, a diesel pusher. The mid-sized rigs are exclusively for RVers with wheelchairs and walkers. Each model can be further customized depending on a buyer’s needs. For example, a buyer can request a specific heights for the beds and toilets. Need more handrails? Not a problem, Winnebago will add them into the rig. And there’s even an optional ceiling track system installation for mobility without a wheelchair. Even more customization is offered with specific furniture requests, cabinetry, and aesthetic changes to the rig. 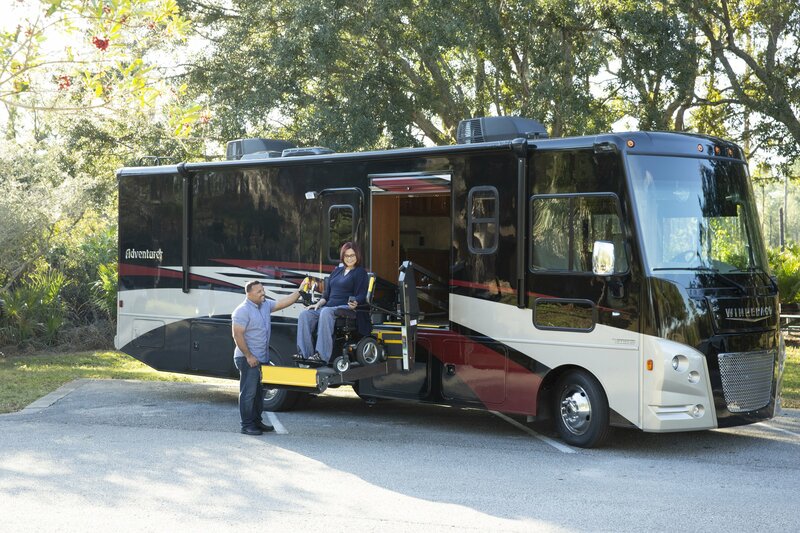 The new wheelchair friendly motorhomes make travel easier for physically challenged people and service animals alike. The Winnebago accessibility-enhanced RVs open up a whole new kind of adventure for the entire family. And with RV trip planning help through the many online resources for RVers with mobility challenges, owners of the Intent, Adventurer and the Forza can more easily experience North America’s greatest wheelchair friendly destinations and beyond. Now that’s AWESOME!!!! Thanks Winnie…. I’m interested in purchasing a wheelchair accessible motor home. I’m single and travel a lot. I grew up going camping & miss the outdoor experience but can’t afford the large extravagant models. I’d settle for something not so big and gently used. Thank you!